The American Bulldog is a descendant of the English Bulldog, imported to the American South to catch livestock and protect plantations, and used in the North to fight off feral pigs. The English Bulldog (or simply ‘Bulldog’) was bred in England in the 1500’s for bull baiting, a popular gambling ‘sport’ in which one or more dogs were matched up against a chained bull (or bear). These dogs were bred for sheer fighting capacity, and they were famed for latching onto their prey with an iron jaw which they refused to release—they could even suffocate opponents this way. The American Bulldog is perhaps the most faithful strain to the English Bulldog as it was imported to America before the English Bulldog was crossed with the Pug during the Industrial Revolution. American Bulldogs are generally divided into two strains: the Classic American Bulldog, also known as the ‘Johnson’ (after its breeder) or ‘Bully’, and the Standard American Bulldog, also known as the Scott (after its breeder) or ‘Performance’. 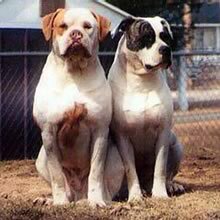 The American Bulldog is a bit faster and substantially larger than the French or English Bulldog at 50-71 cm (20 to 28 in) and 27-54 kg (60-120 lbs). The Johnson American Bulldog is the larger of the two strains. The American Bulldog’s face resembles a Pit Bull, but the muzzle is boxier and it typically has uncropped ears and a bulkier head. The American Bulldog is built strong and agile, with a large chest and legs, low-set tail, and stocky frame. The American Bulldog has a short coat which is close and stiff to the touch. Most American Bulldogs are white with patches, but any color combination is acceptable except solid black or blue, or white with black and tan. The American Bulldog is powerful, confident, and agile. It is naturally alert, inquisitive and fearless. It has often been called heroic, and when deployed against an intruder it is nearly unstoppable. The American Bulldog is a highly obedient and confident breed. The American Bulldog is powerful, confident, and agile. It is naturally alert, inquisitive and fearless. It has often been called heroic, and when deployed against an intruder it is nearly unstoppable. The American Bulldog is a highly obedient and confident breed. The American Bulldog is affectionate toward children if properly trained and socialized. It can be somewhat standoffish or aggressive around strangers. Because they were originally bred to bring down bulls and other livestock, American Bulldogs have a strong aggressive instinct with other animals. They should be properly socialized when young. You can find American Bulldog puppies priced from $200 USD to $50000 USD with one of our credible breeders. Browse through our breeder's listings and find your perfect puppy at the perfect price. The American Bulldog is affectionate toward children if properly trained and socialized. It can be somewhat standoffish or aggressive around strangers. Because they were originally bred to bring down bulls and other livestock, American Bulldogs have a strong aggressive instinct with other animals. They should be properly socialized when young. When the American Bulldog is shedding, use a coarse comb to remove dead hairs. It is prone to hip dysplasia. The American Bulldog has a lifespan of 8-12 years. Most American Bulldogs cannot swim and are averse to hot weather. Consistency is important, but the American Bulldog is highly sensitive to the tone of its handler's voice, making training a fairly simple process. It is inquisitive and quick to learn simple tasks, yet unpredictable as it is a bit stubborn on occasion. Training should begin as early in the American Bulldog's life as possible. It retains what it learns for a very long time. The American Bulldog is very energetic and needs lots of exercise. American Bulldogs enjoy long walks, jogging, playing catch, and agility or skills trials. American Bulldog Puppies for Sale - Shipped Worldwide! Finding the right American Bulldog puppy can be dog gone hard work. PuppyFind® provides a convenient and efficient means of selecting and purchasing the perfect American Bulldog puppy (or American Bulldog puppies) from the comfort of your home, 24 hours a day, 7 days a week. Take advantage of our PuppySearch or leisurely browse our directory of hundreds of dog breeds, American Bulldog dog breeders, American Bulldog dogs for adoption, and American Bulldog puppy for sale listings with photos and detailed descriptions. Some American Bulldog puppies for sale may be shipped Worldwide and include crate and veterinarian checkup. Many American Bulldog dog breeders with puppies for sale also offer a health guarantee. With thousands of American Bulldog puppies for sale and hundreds of American Bulldog dog breeders, you're sure to find the perfect American Bulldog puppy.